Dare I say that Vermont is now my favorite of the US states that I have visted so far? No, it would be impossible to choose a favorite. I was so in love with Utah and its canyons in my hiking days in the 1990s. It isn’t fair to compare the two….so different and so incredibly beautiful in their own way. 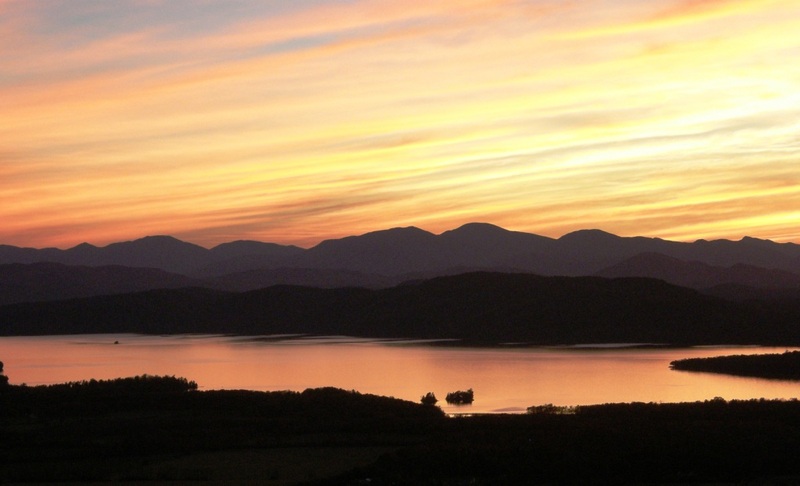 This is just one of the lovely sunsets we had last week from Mt Philo overlooking Lake Champlain. Lausanne took me up there 15 minutes before the park closed. We were told it would take 7 minues to get to the top….I figured 7 minutes up, 5 down and 3 left over to enjoy the view. About thirty minutes later we still couldn’t peel ourselves away from the spectacle and the park guard finally had to come and coax us to leave so he could end his day. 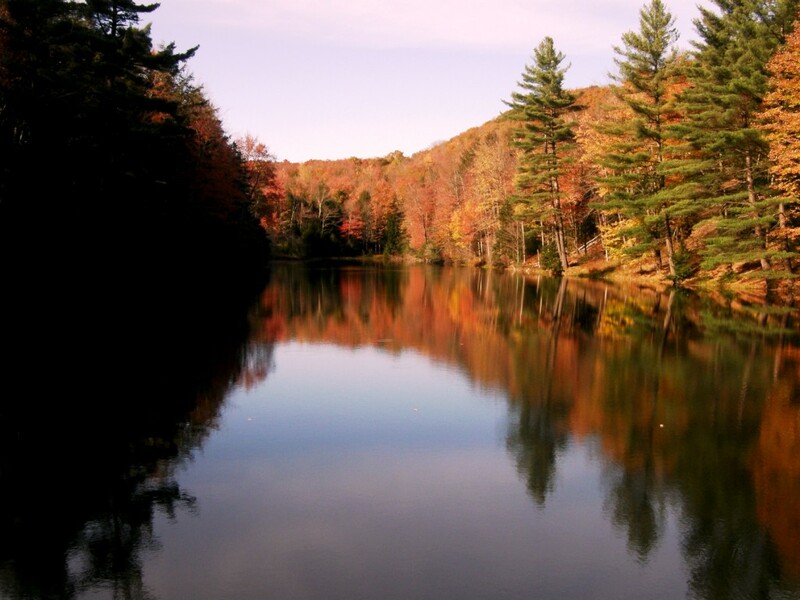 I don’t know if the fall foliage colors have yet to reach their peak and that there are even better things to come. It is hard to imagine it getting better than this! 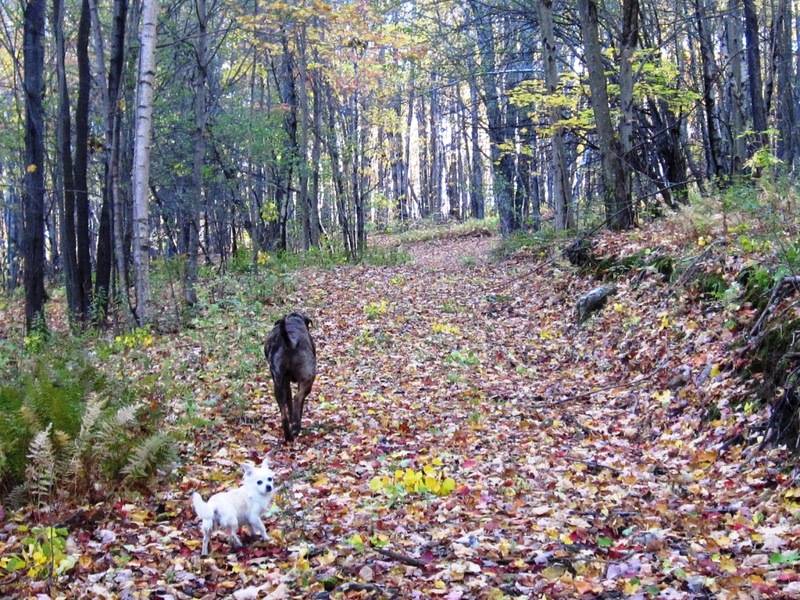 Walking in the woods with the dogs on a bed of fallen leaves of all colors….. Here, in the home of Lausanne and Brian, I wove with two groups of backstrap weavers…friends and neighbors of Lausanne’s as well as a lady I know from one of the Ravelry groups. Apart from one crazily wild rain storm which knocked out the power one evening, we had day after day of warmth and sunshine in which to explore the area. 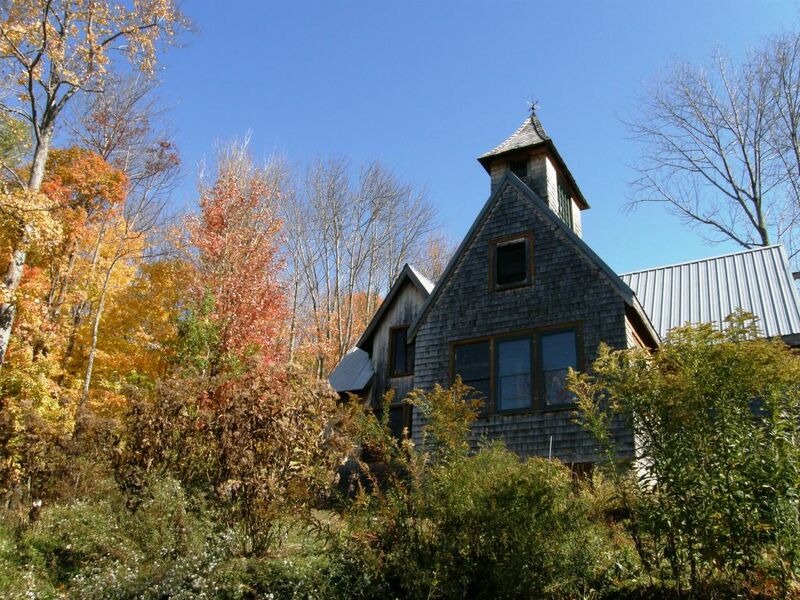 And who can begrudge a power outage when you get to enjoy Brian and Lausanne’s home in the glow of the wood stove and candlelight…. The sun filled Lausanne’s living room with light and warmth as we settled down to play with backstrap looms. 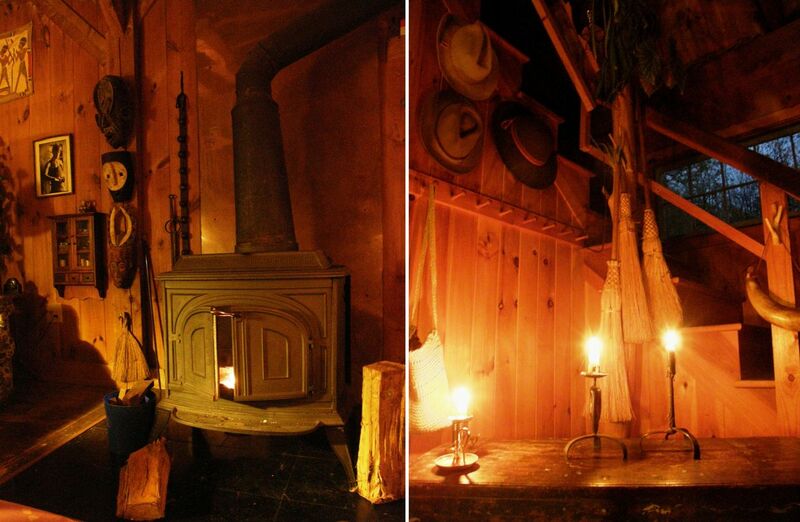 The wood stove provided a little early morning warmth while the afternoons had us opening windows and doors to enjoy the freshness of the beautiful day. This plant rack by the window turned out to be a handy place for anchoring some of the backstrap looms. A sturdy table was the anchor for others. And the back of the sofa provided one more ideal spot for weavers to attach their warps. 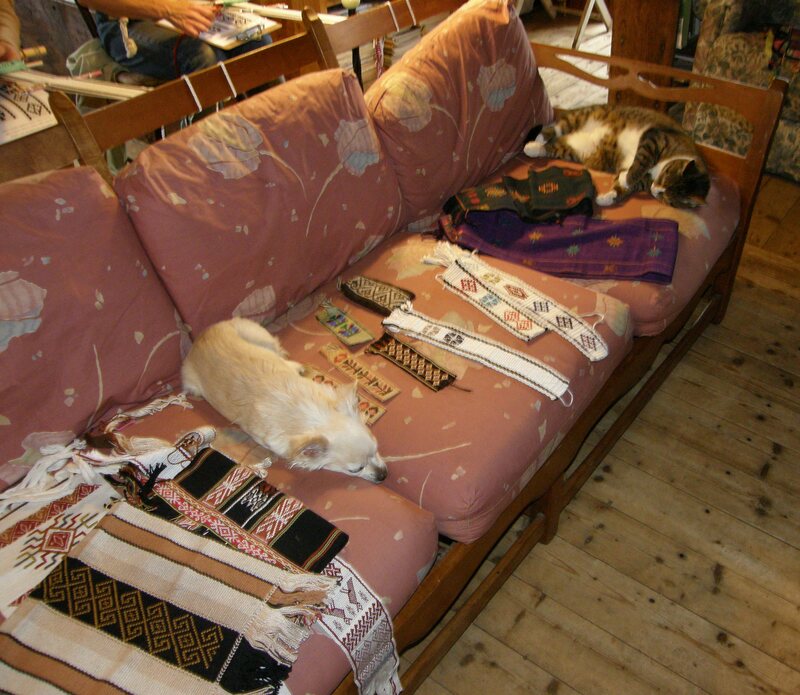 The pets helped in their own way, adding their weight to the sofa snoozing among my weaving samples so that the sofa woudn’t be dragged away with the weavers’ vigorous beating or over-zealous tensioning of the warps. 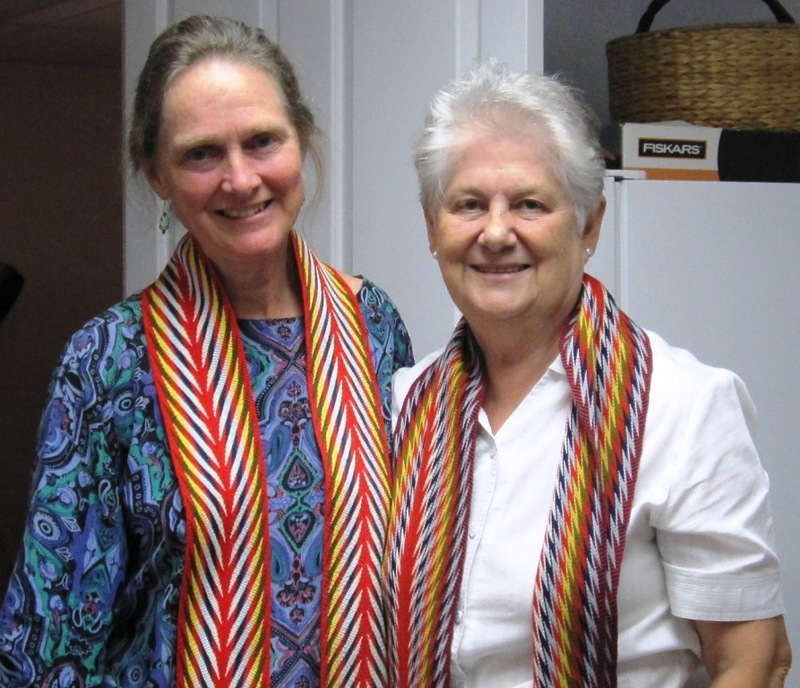 Candace and Nancy pause for a smile while taking their first steps in backstrap weaving. Candace is flanked by Lisa and Julia. Annie starts to get the hang of coordinating the moves which allow her to open the heddle shed smoothly. 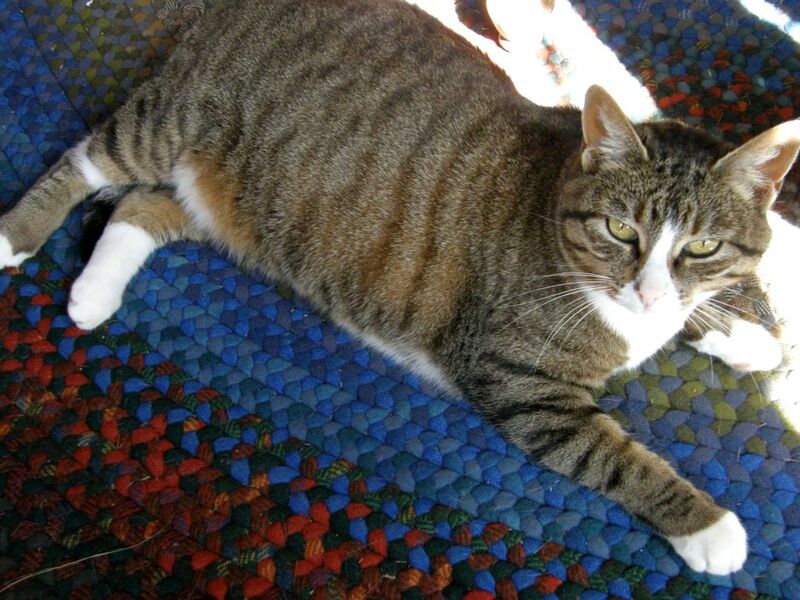 The cats stretched out between us on Lausanne’s many very large, and richly colored homemade braided rugs that adorn the wooden floors. 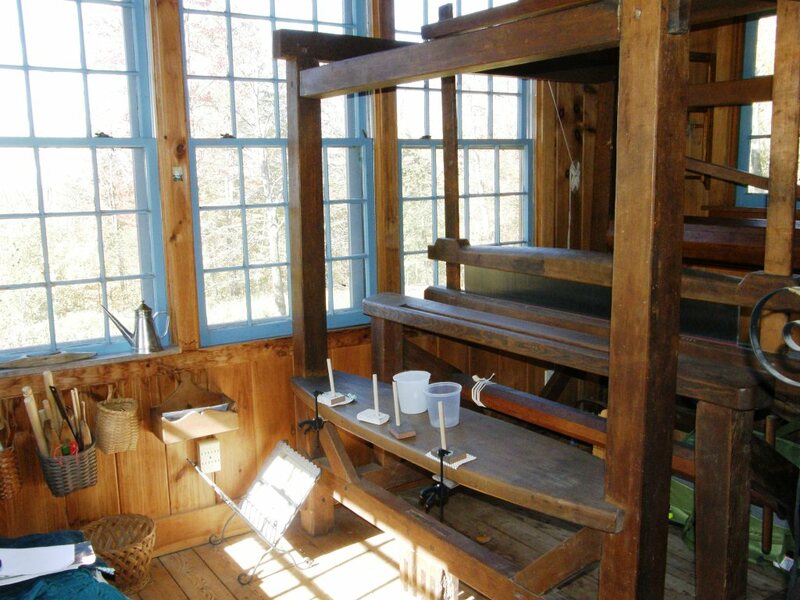 The bench of the grand old barn loom in the corner served as one of our warping stations. Lunch breaks provided strolling and recharging time through this kind of thing!…. And, climbing up the ladder to Lausanne’s cupula in the evening gave views to distant hills and eerie red sky sunsets. 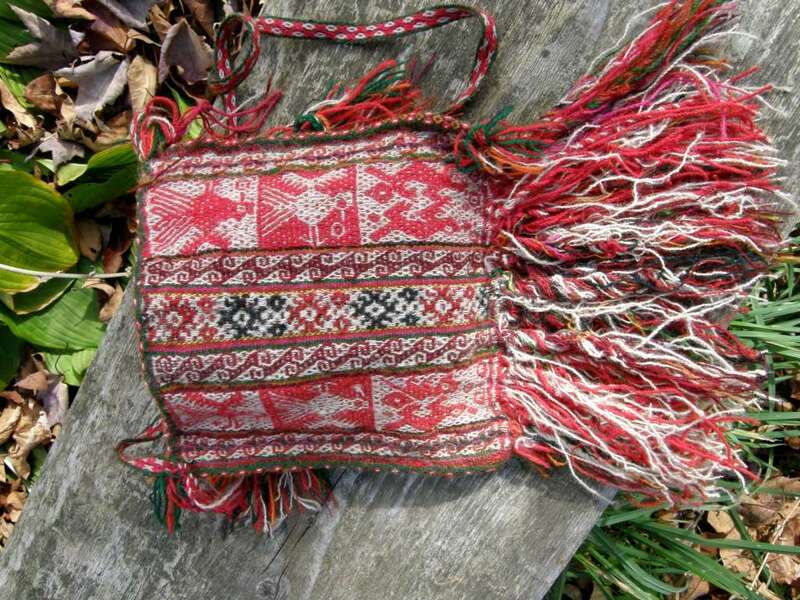 The chuspa, (coca leaf bag) from the Cusco area of Peru, came to me as a gift from the collection of Libby van Buskirk. I had met Libby on Facebook via an introduction from Lausanne and Lausanne took me to visit her and her husband, Dave, in her Vermont home one evening. There was so much to see and talk about in so little time! I was shocked when she offered me the gorgeous chuspa. 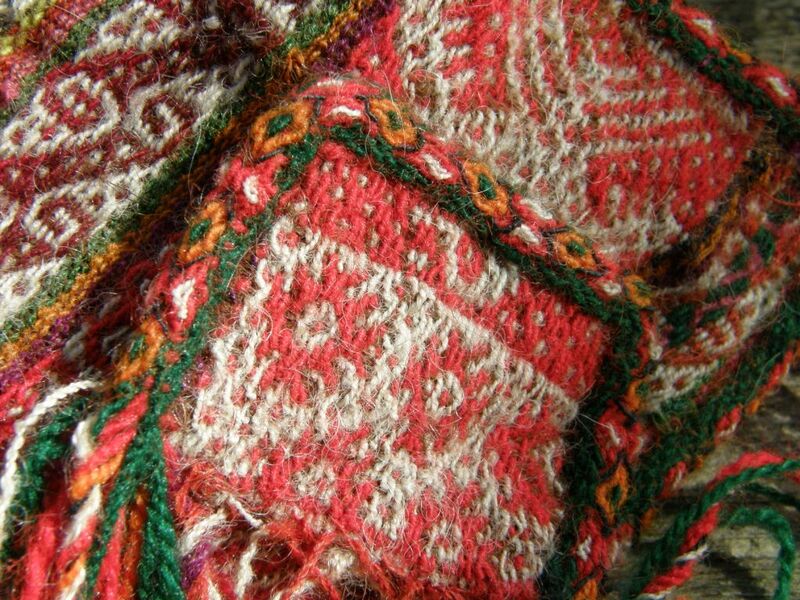 As much as I like the fine, high quality weavings made with naturally dyed handspun yarn that the Cusco Center for Traditional Textiles has been ecouraging weavers in the Cusco communitues to produce, nothing can beat these slightly older and more rustic pieces, in my eye. I love the twin pockets for the lejia (catalyst in powder or solid form) that you can see in the first picture. Those little pockets are woven along with the main bag. Narrow extensions are created for the pockets as the pieces are being warped. This construction is something I studied with my teachers in Potosi, Bolivia and you can see our warp for a single pocket chuspa underway below, the narrow extension being what will form the pocket. 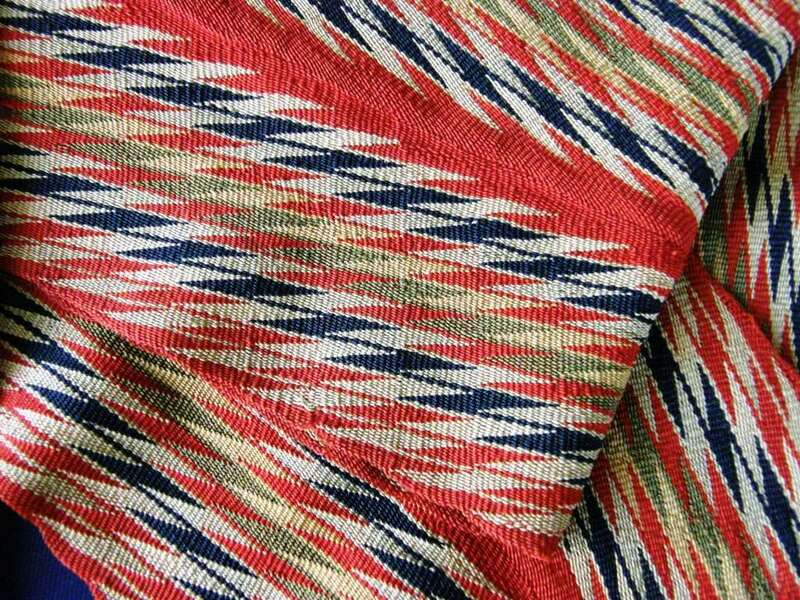 It looks to be the same kind as that is used by weavers in Chahuaytire to edge their woven pieces (Libby does not recall the community in which the chuspa originated).It has quite a different appearance when woven with the heavier more rustic wool and acrylic. 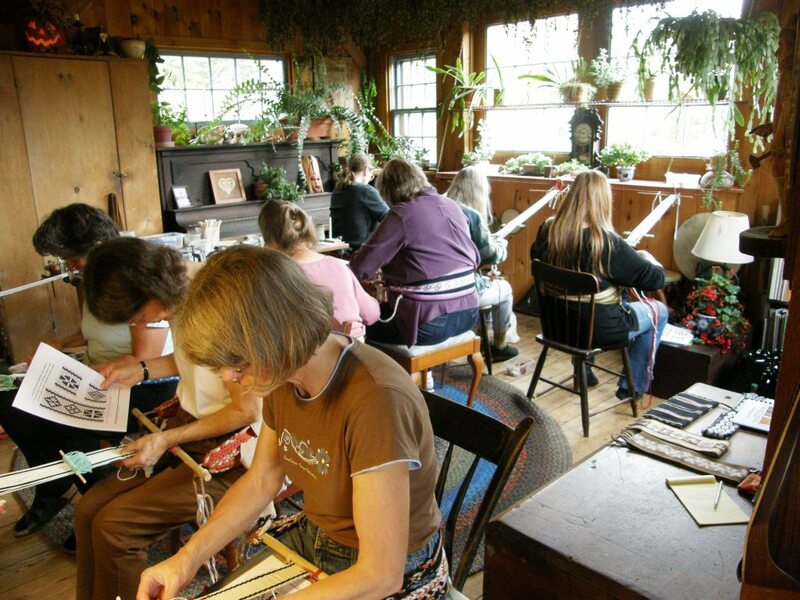 Look at band that lines the recently woven alpaca piece from Chahuaytire below. 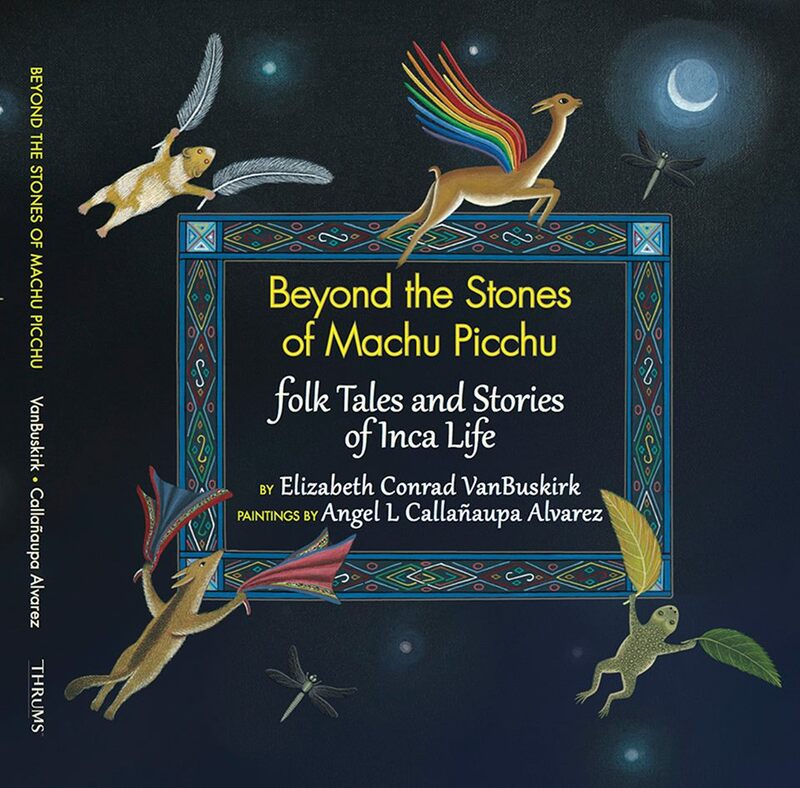 The book includes three folk tales as well as six of Libby’s own original stories of Inca life. Lausanne and I got a preview and the book is simply gorgeous, designed by Ann Douden, and beautifully illustrated with paintings by Angel Callañaupa (you will recognize that last name I am sure). 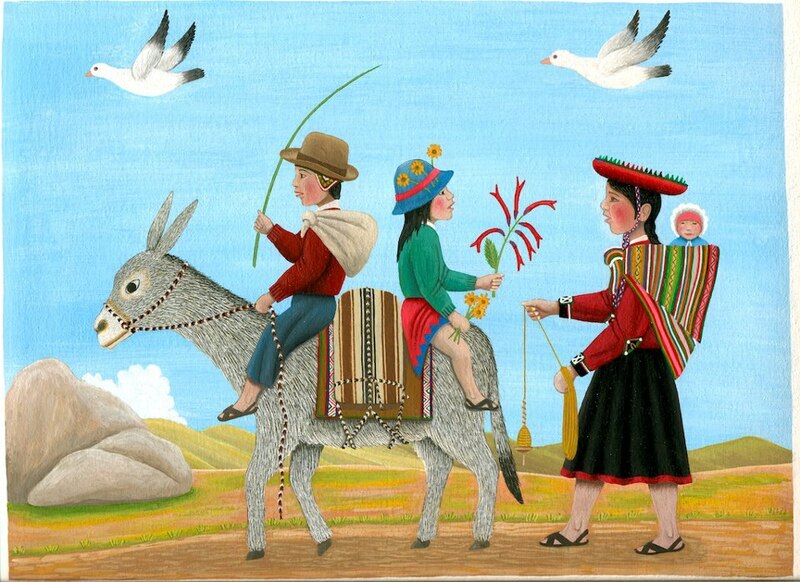 Those of you who have Nilda’s first book will know Angel Callañaupa’s work. 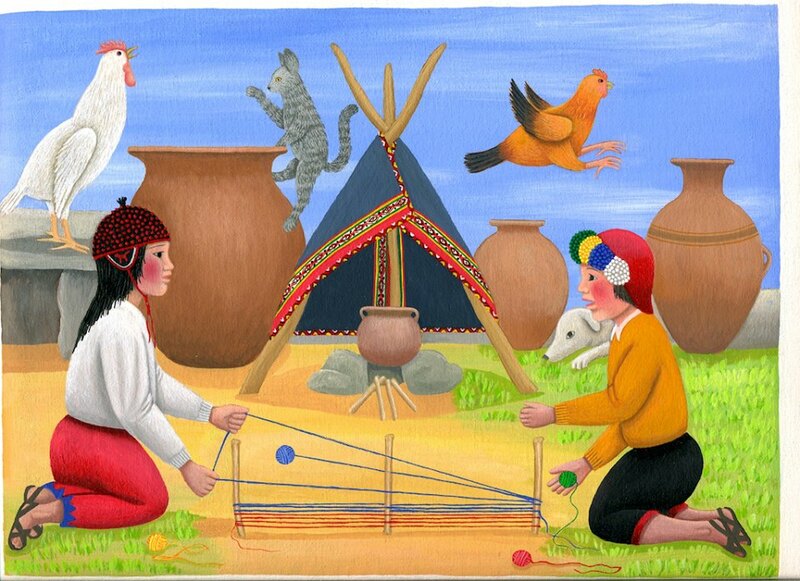 That first book includes his painting of a young girl dreamng her weaving memories. 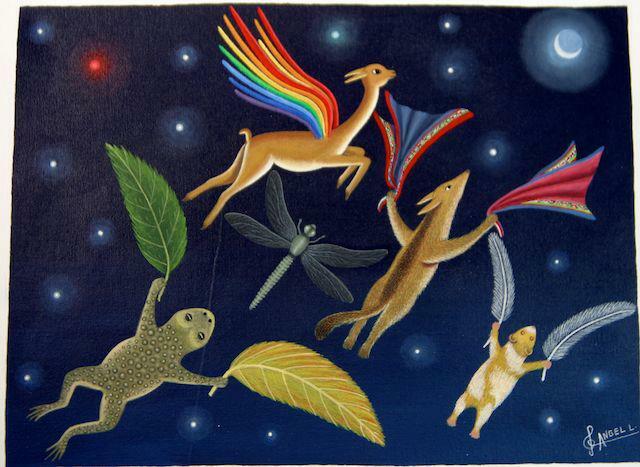 The flying vicuña, fox and frog all seeking the moon. 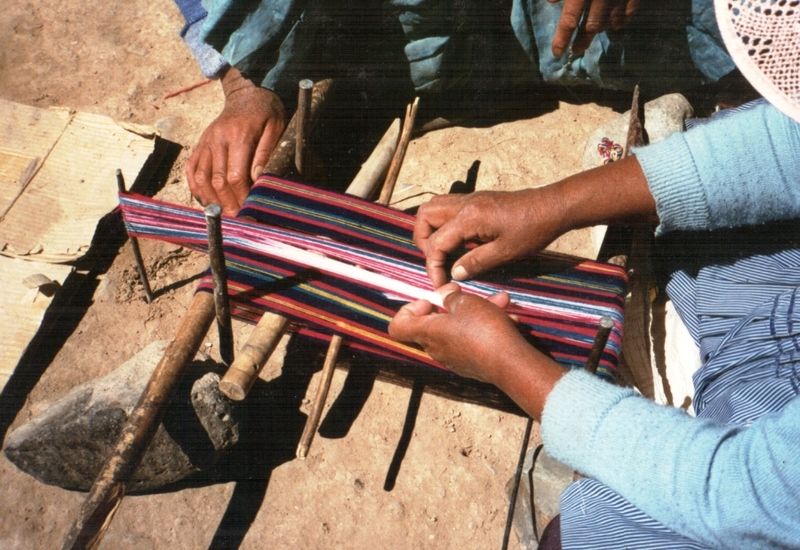 Inca children working together to wind a warp to make a narrow loom. This one is from Libby’s personal collection. 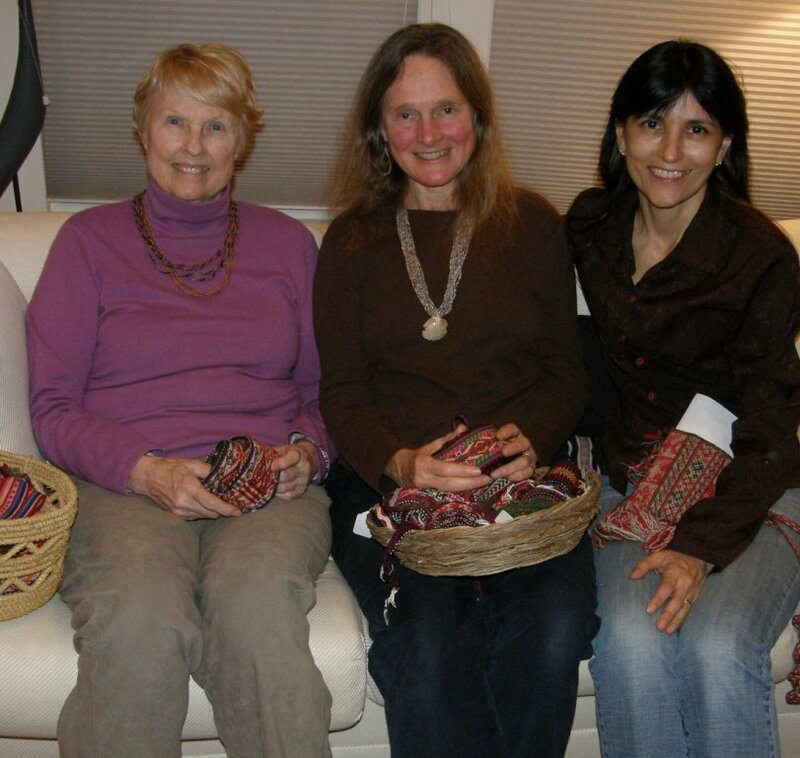 Libby talked of her connection over many many years with Nilda Callañaupa, founder of the Center of Traditonal Textiles in Cusco, Peru.. She is godmother to one of Nilda’s children and she and Dave helped found the Club de Jakimas where young girls are encouraged to learn to weave and continue the weaving traditions of their communities in the Cusco region. 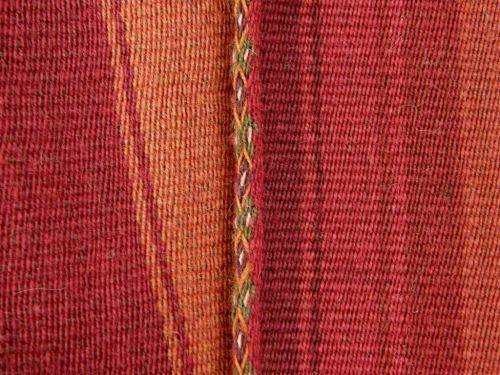 The other textile that I showed above is an exquisitely fine old finger woven sash from the L’Assomption tradition. 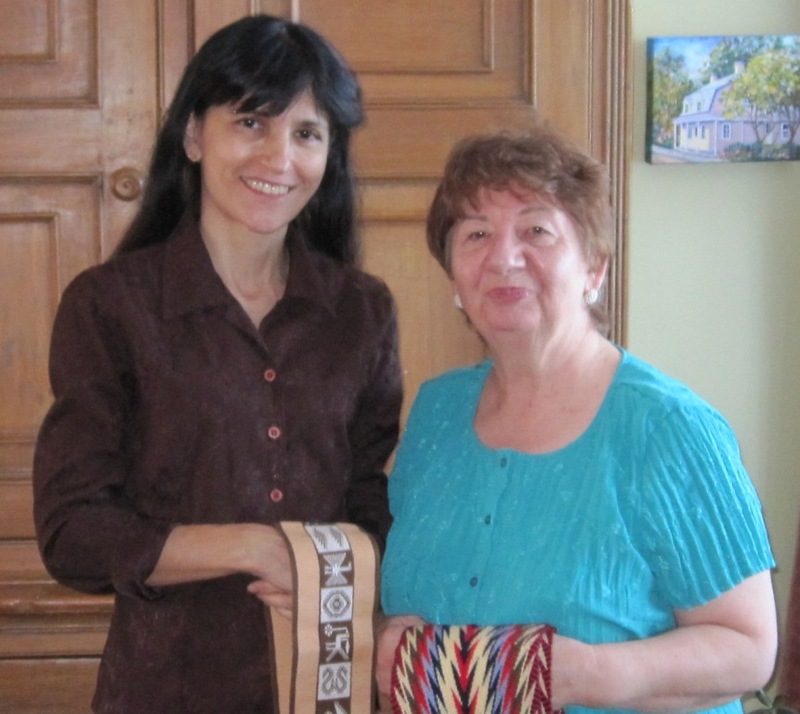 Lausanne, Brian and I took a road trip up to Quebec to the town of L’Assomption and met with two ladies who are carrying on the tradition of creating finger woven sashes. What a treat! It was exciting being in a place where French was spoken after many many years of not experiencing that (and realizing that all the French that I had strived to learn in the 1980s was well and truly gone!). Meeting with France and Jocelyne was wonderful. Between the two ladies who welcomed us into their homes, we learned about the history of the sashes, saw their work and pieces from exhibits, watched a demonstration the weaving, listened to explanations of the natural dyeing process and saw the substances and learned about the yarn preparation process they use, It was a lot of information in one afternoon! 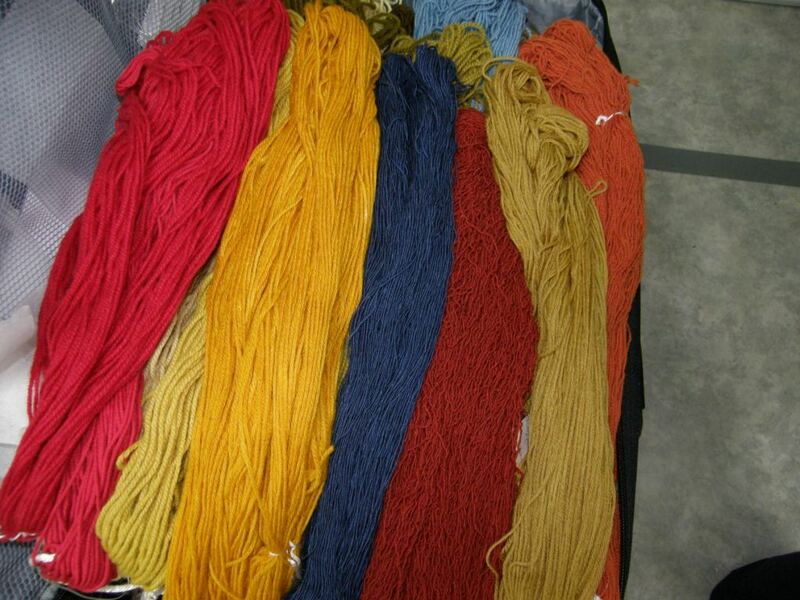 A suitcase of respun naturally dyed yarn ready for finger weaving by Jocelyne. Lausanne and Jocelyne with examples of Jocelyne’s work. 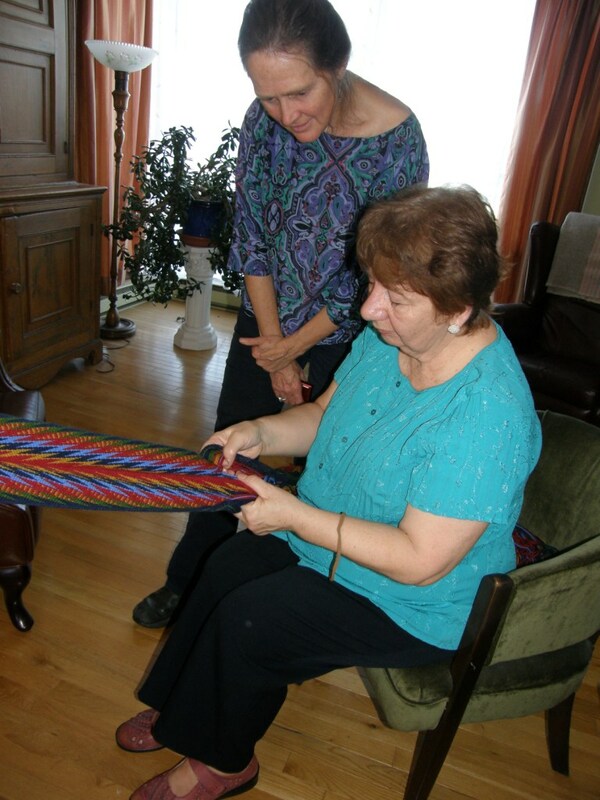 I took along examples of my backstrap weaving and Jocelyne in particular was very keen to learn. Who knows…one day…. Both ladies were so generous with their time and information. I think back to the early 90s when I first arrived in Chile. I had that small manual on finger weaving/ Indian braiding by Alta R Turner and had a lot of fun working my way through the book. 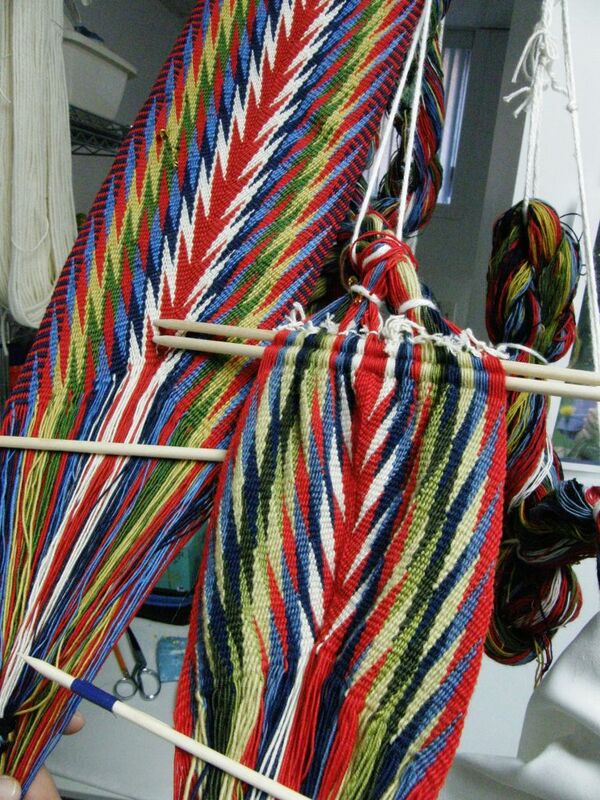 Then came Navajo weaving, a bit of card weaving and then backstrap and all that got left behind. France demonstrates finger weaving as Lausanne looks on. Two of Jocelyne’s pieces in progress. France exchanged threads below with those above as she worked her way across the warp saying “below,, above, below, above” etc as she went, in French of course, which is ‘”au-dessous, au-dessus, au-dessous, au-dessus”. I think I might go crazy trying to follow those directions as, to my non-French ear, those two words sound so much alike! I imagine myself as her student constantly reaching for the thread below when she was telling me to take the one above and vice versa. I guess it’s like the difference in pronunciation in the English words “ship” and “sheep” which Spanish speakers find very hard to hear. I have a very funny story about the embarrassing result of one of my Bolivian male teaching colleagues confusing the words “kiss” and “keys” because he had difficulty hearing the difference in pronunciation. The beaded sashes were particularly striking. This one was made by a gentleman in the study group that was formed in L’Assomption in the 1980s and to ensure the continuation of the art. Then it was back to the USA and back to Vermont and some Andean pebble weave. Most of the folks from the first group came for this second gathering. Lausanne tried her hand at the ñawi awapa band, we roamed about seeing local towns, lakes and vistas of fall foliage and I even got to go to one of the dances at which she called. And, with all that activity, time has simply flown by! 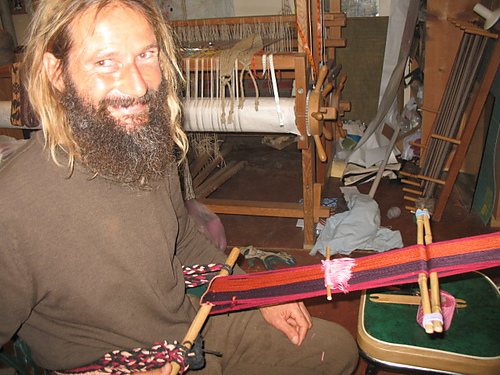 My bedroom during my stay has been Lausanne’s sweet and cosy weaving studio which is in a separate cottage. 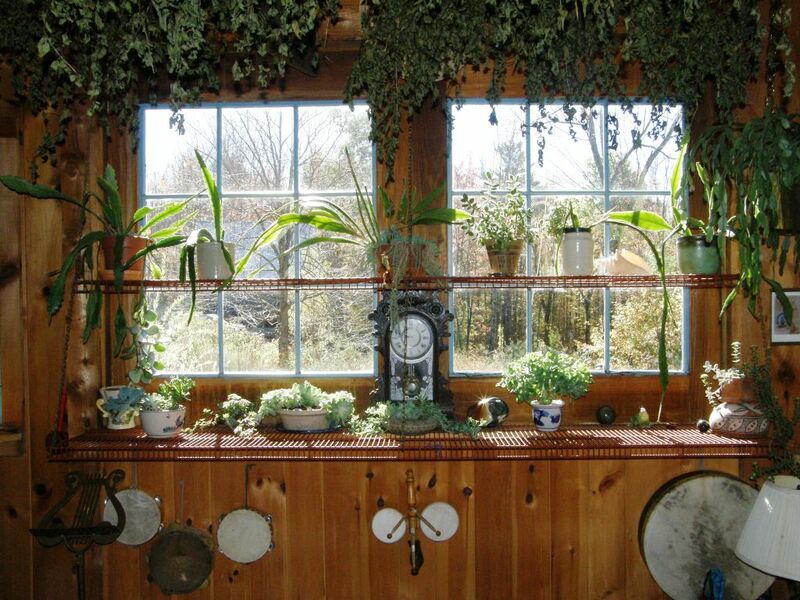 The studio lies above her husband’s black smith workshop…such a talented pair these two! Lausanne is currently a musician, teacher and dance-caller (and has an abundance of other skills) and Brian creates practical and decorative pieces at his forge and in his workshop and has a list of commissioned pieces on which he is working. Below you can see just one of what is surely hundreds of pieces created by Brian Anderson which adorn the cottage in the woods. This is the handle of the door which opens to the stairway up to “my” room. 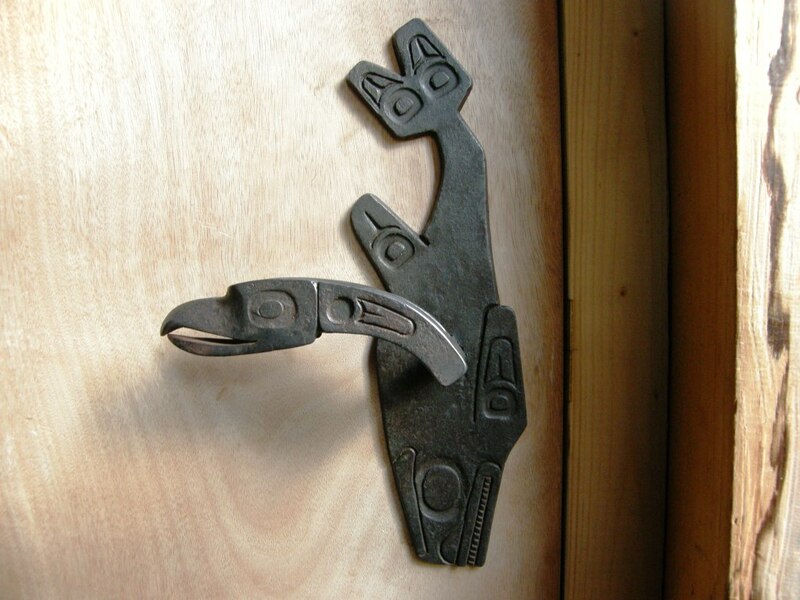 The designs are those of the indigenous peoples of the pacific northwest. And when Lausanne needed a hook from which to suspend her backstrap warp, Brian created one for her….and not just any old hook…a work of art in itself. 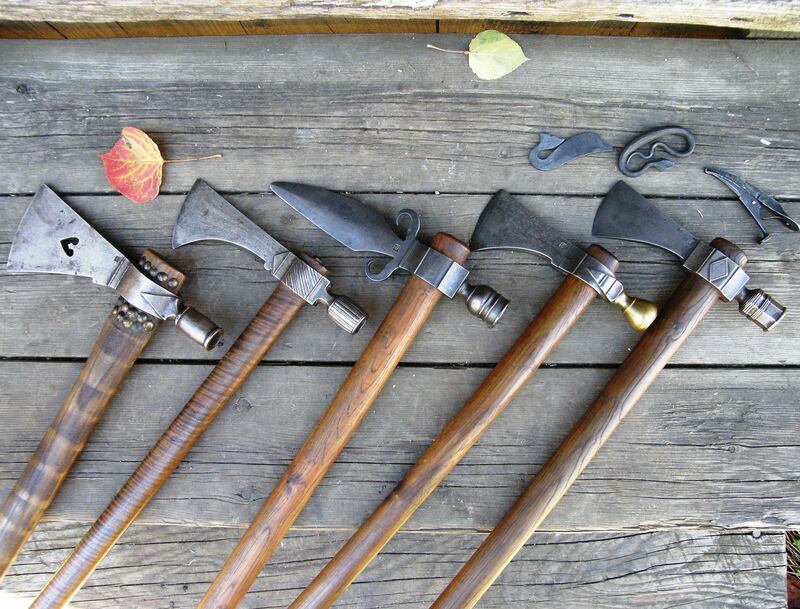 Here is a set of of some of the tomahawks that Brian has made. The four on the right are replicas of mid 18th century pieces and double, as they did back then, as smoking pipes. The one on the left is a replica of a 19th century piece. I loved the small piece up in the upper right corner…the “smokers’s companion”…pincers with which to hold a coal for lighting the pipe and other parts for tamping down the tobacco and cleaning the pipe. The other small figures are for striking against flint. There are so many little treasures around and about in Lausanne and Brian’s home. i could spend days and days examining them all and each piece has a story. 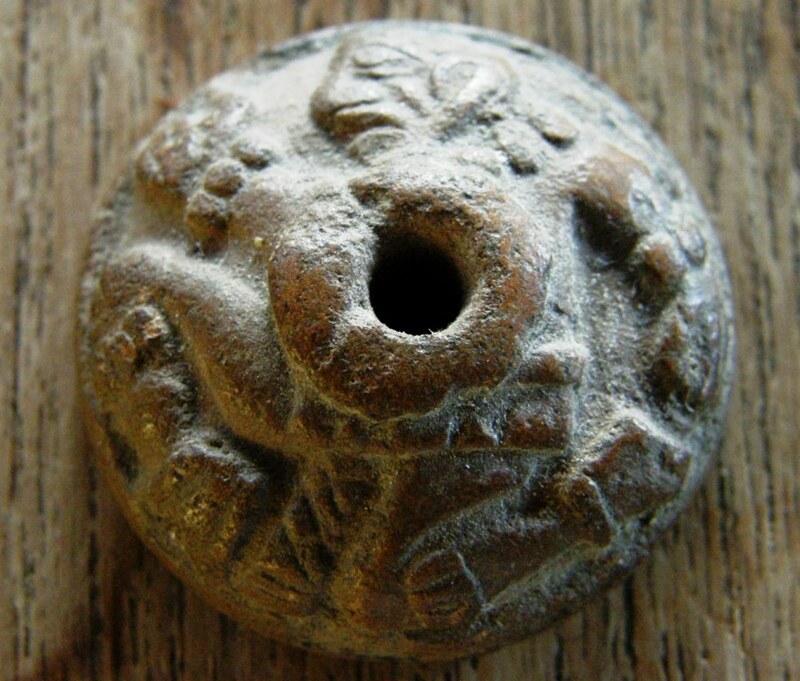 When I brought in my little spindle whorls from Ecuador to show, Brian brought out this beauty that he got from Mexico many years ago…. I have loved my stay here. I hope that I can come back to Vermont again. Lausanne is organizing a study group and I hope the weavers that I met these two weekends will get together to weave and support each other. I am looking forward to seeing what they create. Nancy, who wasn’t able to weave with us the second time, went out and got some Plymouth yarn in a closing down sale and had a backstrap woven within days. 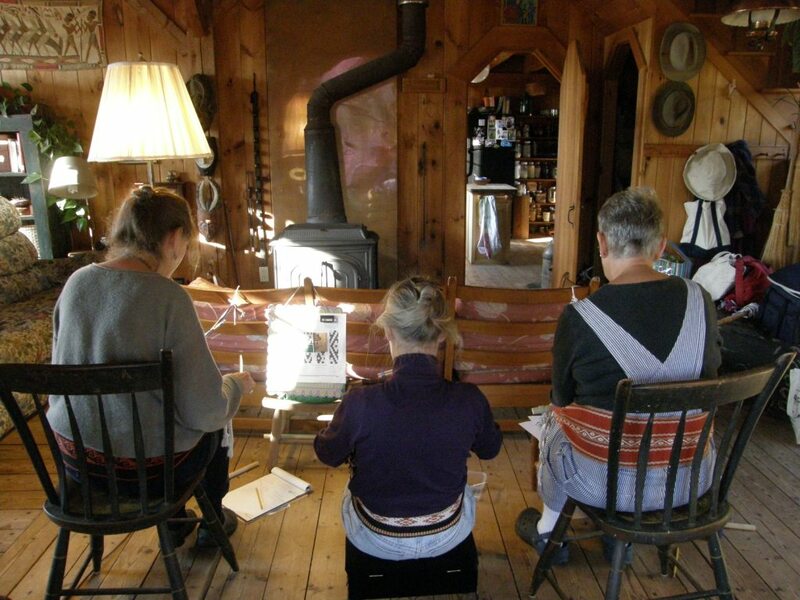 Meanwhile, on the other side of the US, Janet has been weaving with her handspun and teaching various people who stop by at her farm and mill. 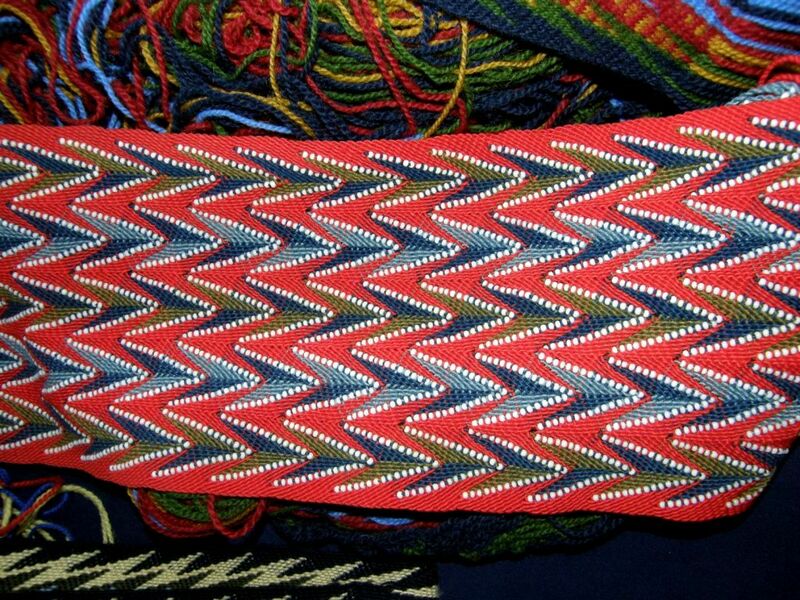 Janet promised a picture showing both sides of her guitar strap she wove in the intermesh structure (I teach it in my second book!). 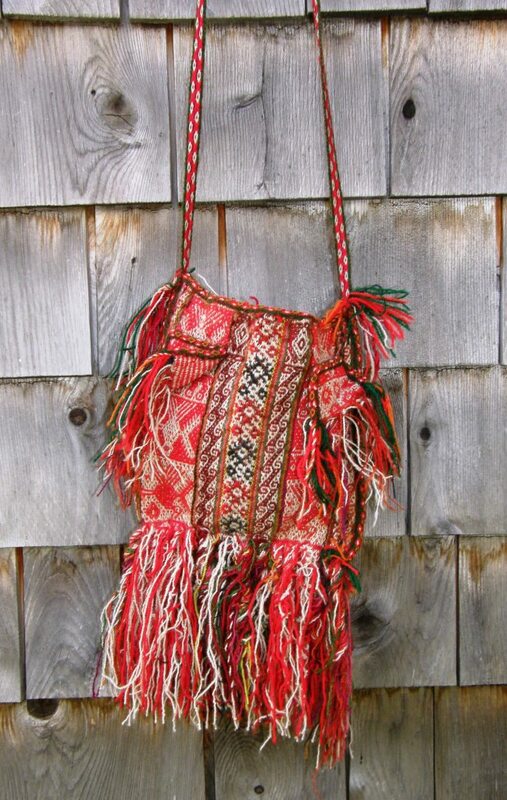 The guitar strap is SO amazing!….woven with Janet’s handspun naturally dyed wool. 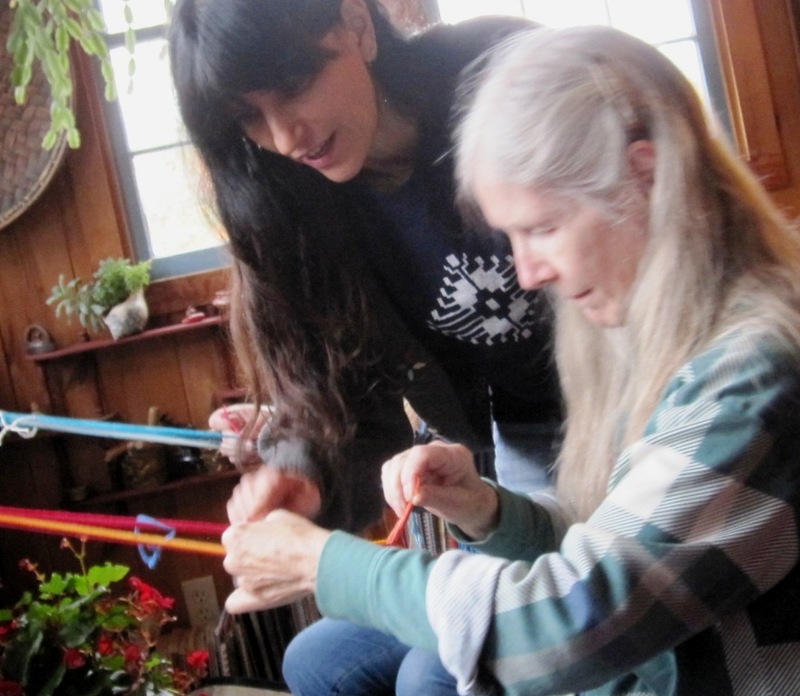 I love how she uses her tiny woven bands in her loom…. there’s a tanka choro saver cord and she is using a pebble weave band and a ñawi awapa as ties. What a gorgeous combination of colors. She used Plymouth Yarn Fantasy Naturale for the band. It is a heavy-weight mercerized cotton which is great for making backstraps and which was the perfect weight for this project too. What a cool project. If only I lived some place where I could wear slippers. 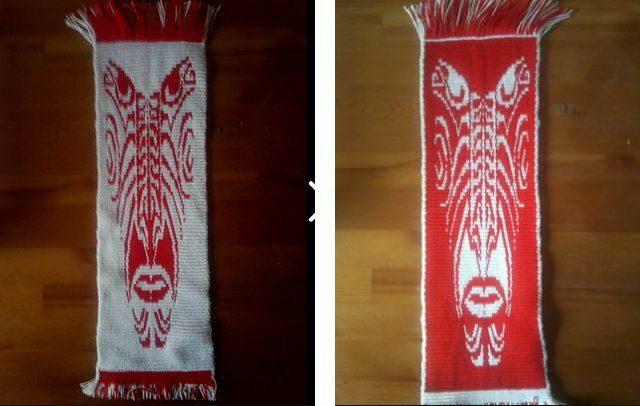 Larisa, who corresponds with me via my Andean Pebble Weave Facebook page, sent me pictures of her own creation in warp-faced double weave. She followed this tutorial on my blog to learn the technique. She calls this design “Tribal Mask”. So…..I am heading south to Connecticut and then up to Massachusetts to weave and weave. 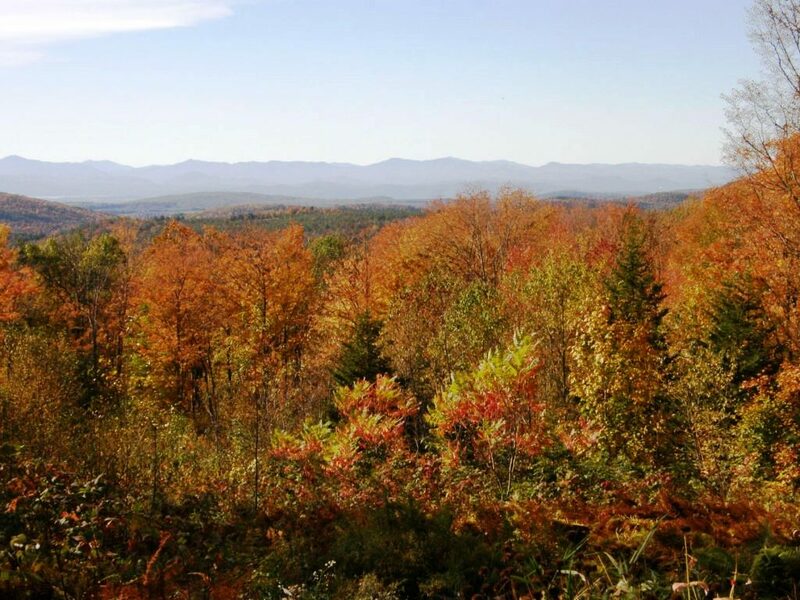 I think that I will get even more doses of lovely fall colors as I head south. 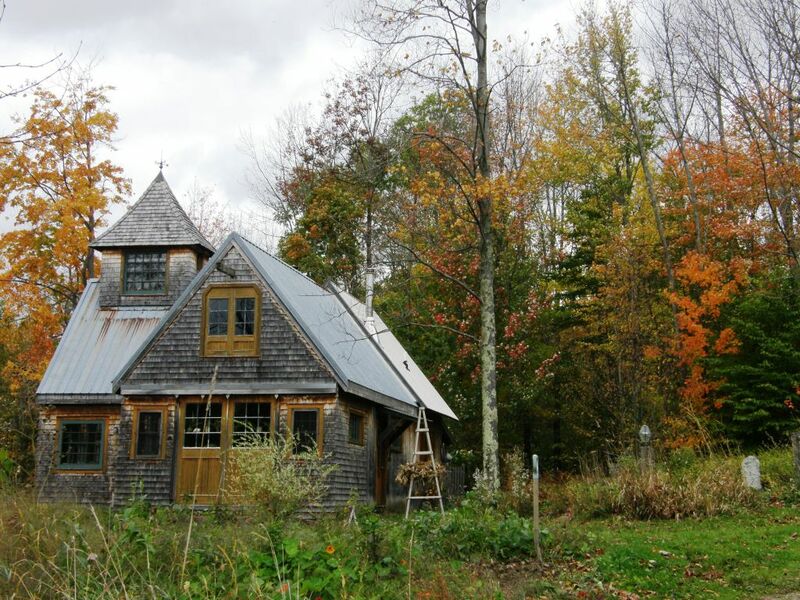 Today in Vermont it is wet and a little dreary (a good day to stay in and write my blog post) and we are noticing that trees that had their colors when I arrived are now bare. I’m so happy you enjoyed yourself. I know we enjoyed you! Thanks kathy. You were an awesome group with oodles of stamina. It was a great fortnight! Hi Yonat, yes, getting to see the finger weaving was a real treat and I am so grateful to Lausanne and Brian for taking me there. I have some video I can show you when we get together. Sounds like a wonderful trip Laverne, and what a perfect time of the year to see Vermont! Enjoy the rest of your trip. Laverne, qué placer recorrer tu blog! Te agradezco muchísimo lo que compartís. Es bello, creativo, amplía la mirada. Cuándo te tendremos por Argentina, Córdoba más precisamente? Sería una gran oportunidad. Atenta a tus próximos post. Not sure which book you mean…first or second. Will email you. What a beautiful place. Your photos were stunning. Such a range of colours to inspire us in new combinations for our weaving. Thanks,, Libby. It was lovely meeting you and I hope that we can do it again some time. I am so looking forward to having your book. Thanks for all of the great photos. How lovely to be on the east coast at this time of year. I’m really envious of your trip to L’Assomption, the place of the finger woven sashes. 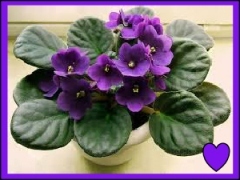 How beautiful they are! Thanks. Annie. See you soon! Katherine, I am in South Deerfield now and have a book for you. See you soon. Great! I’ll plan to swing by tomorrow mid-day (about 1) to meet you and pick up a book. 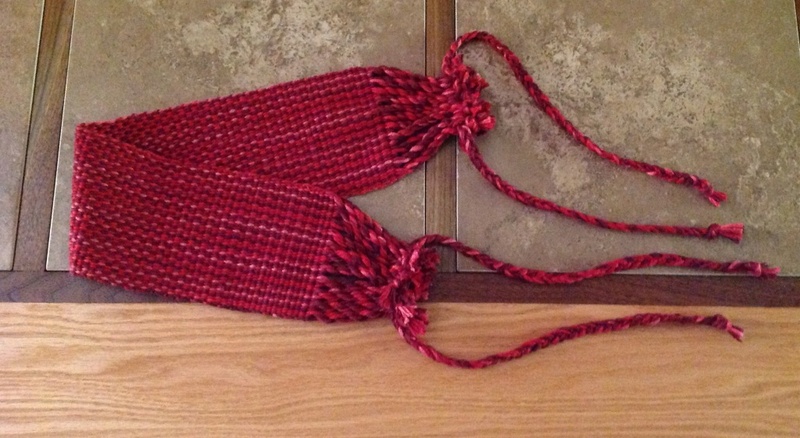 I’m mostly an inkle weaver lately, but I do so love the backstrap I set up a couple years ago with your instructions. Anyway, pebble weave can work either way, so I’m excited to look at your book. Thanks Rory. i mostly teach at guilds that draw workshop participants from their membership. When they can’t fill a class, I post a message about that on the blog. I hope that one day I am in your area so we can meet. Laverne! I can see why you loved your stay in Vermont! Thanks for another wonderful post! Laverne, I just stumbled upon your awesome webniche looking for flat weaving in a cool design for a 40some young fellow from the hills of Pocahontas Co West Virginia. I wonder if you would sell a one inch by 36″ to replace a fedora hat band? Julia’s Pebble looks neat. Thanks! Hi Jose, I am going to pass your message onto my friend Annie who weaves custom straps and sashes. I know that she will make something just perfect for your friend.